It's the most wonderful time of year, the snow is falling and celebrations with friends and family abound. It's moments in the kitchen where coffee fills the air as you cook your favorite seasonal recipes and bake delectable goods, or sled down the hill and hit the slopes. It's the season to gift generously and gracefully. 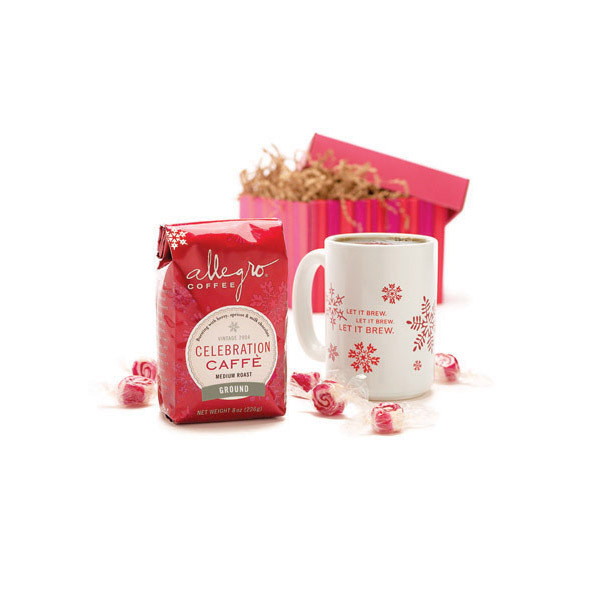 What better gift to give than Celebration Caffé, a gift that can be enjoyed with others? Recognizing that consumers have individual tastes, a couple of Allegro Coffee gift packages were fabricated for Whole Foods Market customers nationwide. One was a special gift box that included peppermint candies from Hammonds, a customized holiday mug and a bag of coffee. The other, a wonderful reusable gift tin that came stuffed with two bags of coffee. POS was created to promote the merchandise and special hot cups were designed for the coffee bars to create buzz around this holiday promotion.